PITTSBURGH, April 3, 2018 – Nationally, 115,000 people are waiting for a life-saving organ transplant, including 2,500 in western Pennsylvania and West Virginia. At least 20 will die each day without receiving an organ transplant. Someone is added to the transplant waiting list every 10 minutes. 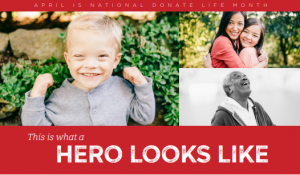 During National Donate Life Month the Center for Organ Recovery & Education (CORE) will join hospital and community partners to raise awareness for organ, tissue and cornea donation. More than 50 events are scheduled across CORE’s service area, which includes greater Pittsburgh, Erie and Johnstown/Altoona. Employees and volunteers as well as donor family members and recipients will attend the events to encourage more people to become an organ, tissue and cornea donor. For every person who donates their organs, tissue and corneas, eight lives can be saved and up to 75 lives can be dramatically improved. Approximately 11,000 people die annually who are considered medically suitable to donate organs, tissue and corneas, yet only a fraction donate. Anyone can be a potential donor regardless of age, race or medical history. To sign up, visit www.core.org/register.